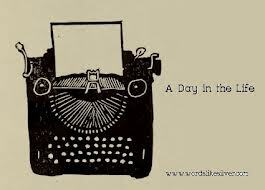 This prompt a day blog challenge is the one that I have been least looking forward to writing. Why? Well because my life to most people would be extremely dull and it’s a sure fire way to lose followers on the blog and on twitter. I am still in the “honeymoon” period of feeling grateful every time a person subscribes to my blog so scaring them off by telling them what happens in a day in the life of me may tip them over the edge. The way I see it – the people that are supposed to be friends and family aren’t interested in what I do from one day to the next so then I am sure a group of strangers aren’t either. Plus, each day is different. Yes the day job stays the same, but the tasks that I do vary, the people I deal with vary, the meetings I attend vary etc. Then depending on what day it is will depend on what activities I get up to in the evening. Netball matches, ice hockey training, theatre reviews all keep me busy. I love my life and the people that are close to me but it’s not a television show and my personal life is not about entertaining others. What I will say is that last week a complete stranger didn’t like a theatre review I had written. I suspect they were a family member of one of the cast or creative of the show. They then used information that I had written in the blog to publically criticise me in a comment attached to the show. The fact that a stranger reacted to a review like that perplexed me, so when I knew that this blog entry was coming up I made a decision then to not personalise myself too much online. Who needs to read about that? This is a post for www.writesofluid.com blog writing challenge. One blog post a day for all of July. This entry was posted in Blog and tagged #wpad, blogging. That sort of public comment must be tough to deal with. I guess that’s one of the risks of putting yourself out there – but it should not keep anyone from saying what she thinks (and I am sure you did so politely). But it’s wise to keep your privacy private.